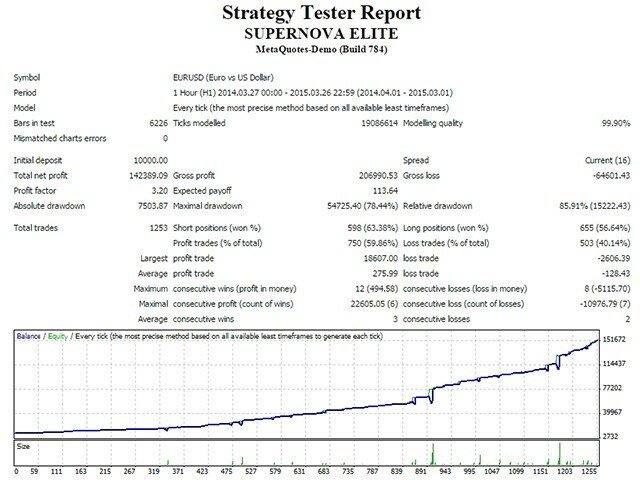 SUPERNOVA ELITE is a Forex Expert Advisor which does not use any indicators and employs four trading strategies. When you attach the EA on the chart of a currency pair, it opens two pending orders at a certain distance from the price and modifies them following the price upon the expiry of time prescribed in parameters. 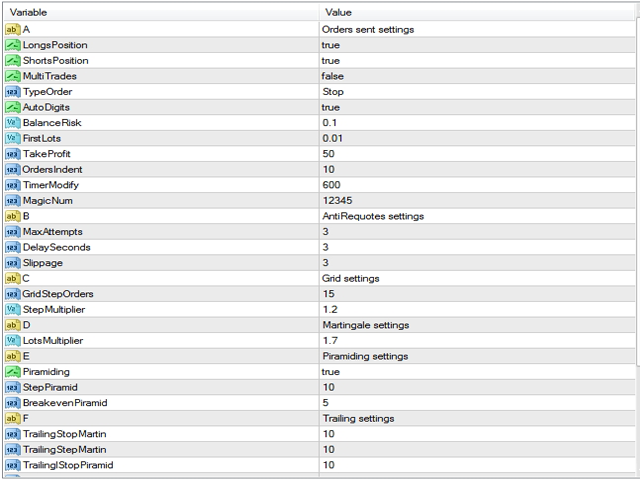 Pending order type is set in the EA's parameters. The EA does not use stop loss. All trades are closed by trailing stop or take profit. Function of the deposit drawdown limit protects your deposit. When this drawdown is reached the EA partially or fully closes orders (depending on input parameters). Function of enable/disable multicurrency trading allows to reduce the load on deposit. If the EA is attached to several currency pairs and MultiTrades = false, then after appearance of an order on one of financial symbols the EA will remove all unused pending orders and start working on the currency pair of the triggered order. Recommended currency pairs: EURUSD, USDJPY, GBPUSD, USDCHF, EURJPY, USDCAD, AUDUSD. VPS server is required. TextColor - displayed data color. Seems to work fine. Changed the MM to 1.4 and no Pyramid. It is working very, very well for me. On my 6 accounts running different strategies, this EA is doing best right now. I have it on all of the recommended pairs on H1. Great EA. A little expensive though. I guess that people who make EA's that is actually making money, can lower the price if they earn money in their trading anyway. Voy a probar a ver cómo funciona en verdad y pondré mi review más tarde con más detalle. Hasta ahora con las pruebas, es uno de los mejores experts! This EA is working perfectly. I am very happy and trust Vladimir to continue to update and support up. Highly recommended. Vladimir is a genius , I have several EAs done by him and I have had good return , this is one of them . I recomomend . You just need learn to know how to configure it. Others that i have and use is Martingale Plan B and Kozachok . In testing I have Grinder , Grid and Printer, all with good response in demo account. СОВЕТНИК ПРОСТО КРУТОЙ НА 5+ ! ОТЗЫВЧИВЫЙ И ТЕРПЕЛИВЫЙ ПРОДАВЕЦ ! ПРИЯТНО ИМЕТЬ ДЕЛО С ПРОФЕССИОНАЛОМ. СПАСИБО ! - Cleaned code, removed unused functions for higher the performance of the expert. - Removed take profit as it reduces the probability of getting maximum profit.